A black couple told yesterday of their shock and mystification when their son was born with white skin and blond hair. He and his wife Arlette already have a two-year-old boy, Seth, whose features reflect his African parentage. But it is thought that baby Daniel, now 11 weeks old, has a slight genetic mutation. He is not an albino. Congo-born Mr Tshibangu, 28, said his ‘jaw dropped open’ when Daniel arrived at Leicester Royal Infirmary. ‘I was too stunned to speak and I could see the doctors looking at each other, thinking the baby couldn’t be mine. Mr Tshibangu, a sociology student, added: ‘The initial reaction from the nurses must have been that Arlette had had an affair. Their faces were a picture, but then I’m sure mine was too. ‘When I bent down and kissed him I got a better look at his features and could see he looked just like me and Arlette. He has my nose and my wife’s lips. His 25-year-old wife added: ‘The reaction in the operating theatre was one of shocked silence, myself included. ‘I stared at Daniel with my eyes wide. The looks on the faces of the doctors and nurses said it all. Everyone was wondering why I had a white baby. ‘But as the nurse put his little pink body in my arms I bonded with him instantly. When I looked at him all I felt was love. Mr Tshibangu added: ‘I know there will be some who say my wife has had an affair but I trust her completely and know that isn’t the case. 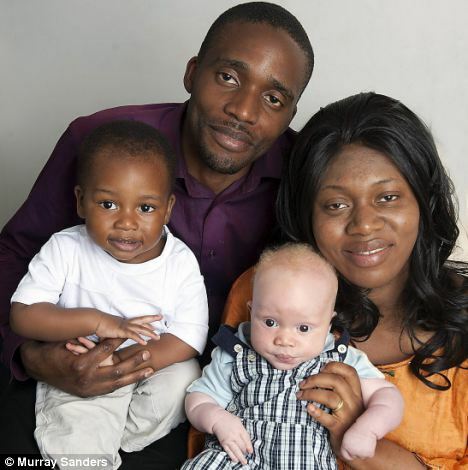 ‘Even if she’d had an affair with a white man, you would expect a mixed-race baby with black hair, not a white baby with soft blond hair like little Daniel.’ Mr Tshibangu, who has lived in Britain for ten years, met his future wife on a return visit to the Congo in 2007. They married a year later and settled near Loughborough. Arlette qualified as a doctor in Africa and, while she is currently working as a part-time shop assistant, she hopes to practise medicine in the UK. He added: ‘You can see people looking at us thinking, “What are that black couple doing with that white baby?” I am sure there are a few people who think we have stolen him. I hope that the family is strong enough to not care about all those idiotic people that can’t stop themselves from judging others just because they don’t fit into their bigoted worldview. No Replies to "Black Couple Shocked After Having A White Baby"